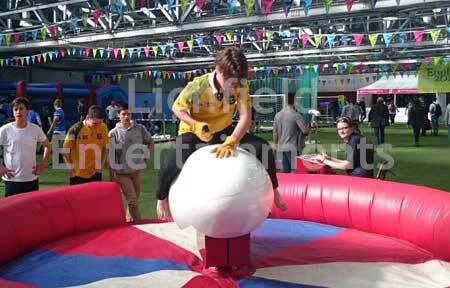 If you're a rugby fan or holding a rugby event then you'll love this great alternative to the usual rodeo bull ride. It uses the same motion unit as regular rodeo ride so you get exactly the same spins and bucks only the rider sits on a giant rugby ball. The rodeo rugby ball is always supplied with a trained operator who will run the ride. Unstaffed hire is not available. All riders must be 4ft or taller and not heavier than 17stone. If indoors you'll need a space of 17x18ft with a height clearance of 9ft. If the venue's not on the ground floor lift access will be required. If outdoors we'll provide an inflatable weather cover free of charge and you'll need an overall space of 23x23ft. Please note that for all events all access points such as gates, doorways, etc must be a minimum of 33inches wide for the equipment to pass through. A mains electric supply will be required although we can supply a generator at additional cost if this isn't available. 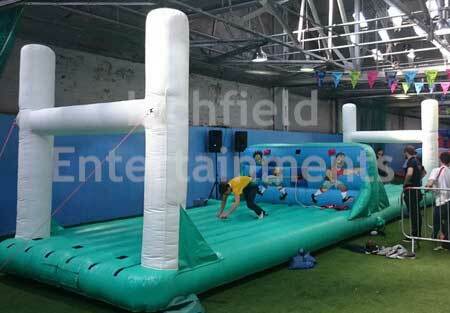 Another of our great rugby themed entertainments is the Rugby Bungee Eliminator. This is a game for two players who on opposite ends of the same elastic bungee rope race to be the first to score three tries by racing from the middle to the end of the inflatable placing the velcro markers under the posts one at a time. It's easier said then done when your opponent is trying to the same at the opposite end of the same stretchy rope. If you have any queries, questions, or would like to hire the Rodeo Rugby Ball or Rugby Bungee Eliminator for your event please click here to enquire and we will do all we can to help.